Thought I'd make a bit of an appeal for other crafters based in the midlands area. I'm currently signed off work sick, so the net has become my haven for all things craft. I think it'd be nice to have a bit of an online community where we can swap hints and tips photos etc. I know Glasgow has a craft mafia, I think it's be quite cool if we got one going in the midlands. ive just added the myspace page and joined the facebook group:) i live in cov....is that ok?? Hi Petrova, thats great if you live in coventry, I was there today it seems like quite a nice place, I was gutted at how pricey hobbycraft is though. Will you be coming to the meeting tomorrow? Do you have any ideas of stuff you'd want from the craft mafia? My bookshop - Opening sale, 10% off! hey sorry i didnt reply to this, ive been going through a bit of a pad patch at the moment. yeah hobbycraft is great but expensive!! did you like coventry?? I did really like Coventry, the city layout was really random though, bits are waiting to be developed and others so overdeveloped. It kinda appealed to me the eccentricity of it all lol. I think I'm definitely going to have to pay a visit there again at some point. Our new Birmingham Crafters site can be found herewww.myspace.com/birminghamcrafters so please feel free to add etc, I'm hoping to get a zine or a group crafty blog on the go, and I'd love some additional input. Hello! 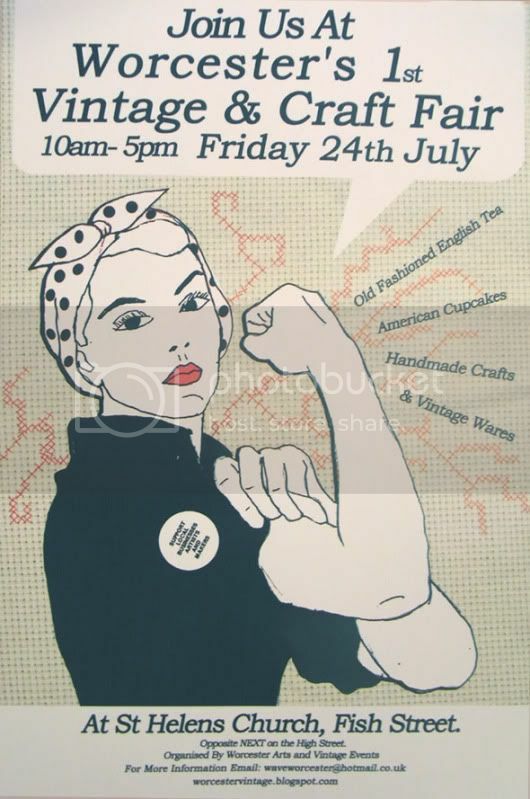 There's crafty happenings in Worcester (only 40 mins from Birmingham!). A group of us set up WAVE - Worcester Arts & Vintage Events and we put on Vintage & Craft Fairs - the next one is on Saturday 3rd October (the one after that is the 12th December) which is now attracting stall holders from a far away as London, and we also run a Rebel Knitting Club every other Tuesdays at The Firefly pub in Worcester for knitters, crocheters and miscellaneous crafters! All are welcome. Our webpage is www.worcestervintage.blogspot.com and we also have Myspace & Facebook groups linked from the blog. I'm Jo from WAVE - Worcester Arts & Vintage Events - a group of independent, vintage retailers, crafters and arts organisers.